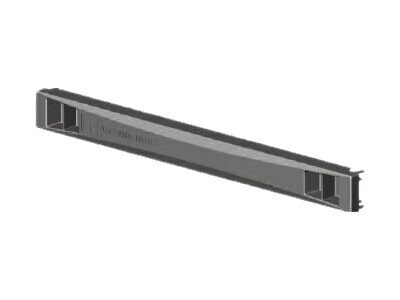 The Snap-In Filler Panel is solid panels used to fill open rack-mount spaces in cabinets that store rack-mount computer servers and data storage equipment. It is designed to occupy the entire rack-mount space height eliminating leakage between stacked panels. Use Snap-In Filler Panel in combination with the air darn kit to create internal airflow barter between the front and back of the cabinet. The airflow barrier blocks recirculation of hot exhaust air from the back of the cabinet to the front of the cabinet, which keeps cooling air temperatures lower because cold air goes through equipment without be rig pre-heated by hot exhaust air. Simply line up the posts on the back of the Snap-In Filler Pane with the square-punched holes in the equipment mounting rails and push - the panels snap in place. To remove, pull the indented areas on the front edge of the panel - the panel snaps out.